Officially, the four city-run funds have $28 billion in unfunded pension debts. Then there’s another $11 billion in official CPS teacher pension debt. Add another $4 billion from the Chicago Park District and the city’s pro-rata share of Cook County-related pension debt. 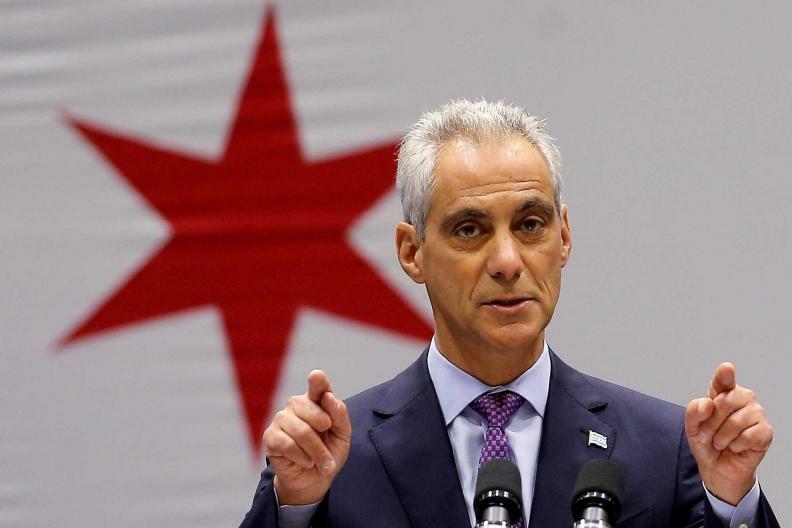 Finally, add Chicagoans’ $27 billion share of the state’s pension debt ($129 billion). In total, the official debt Chicagoans are stuck with adds up to $70 billion. That’s over $67,000 in pension debt for each household in Chicago. But the burden is so much higher than that. That $70 billion is based on the rosy actuarial assumptions used by the pension funds. 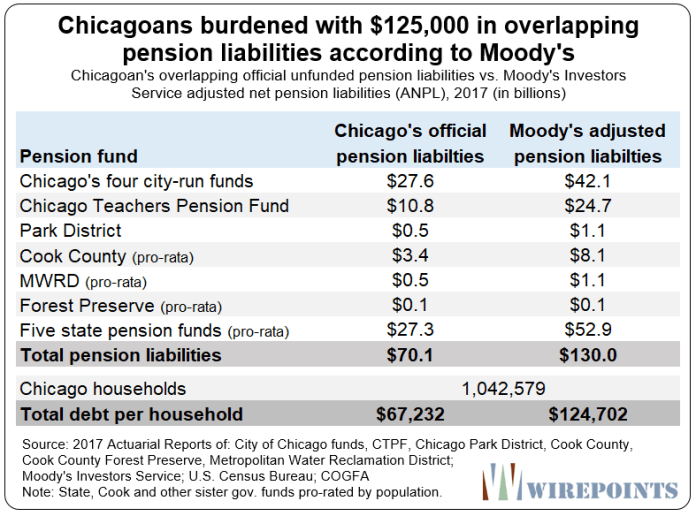 Other financial institutions, including Moody’s, use far more realistic assumptions to figure out the size of Chicago and the state’s pension debt. 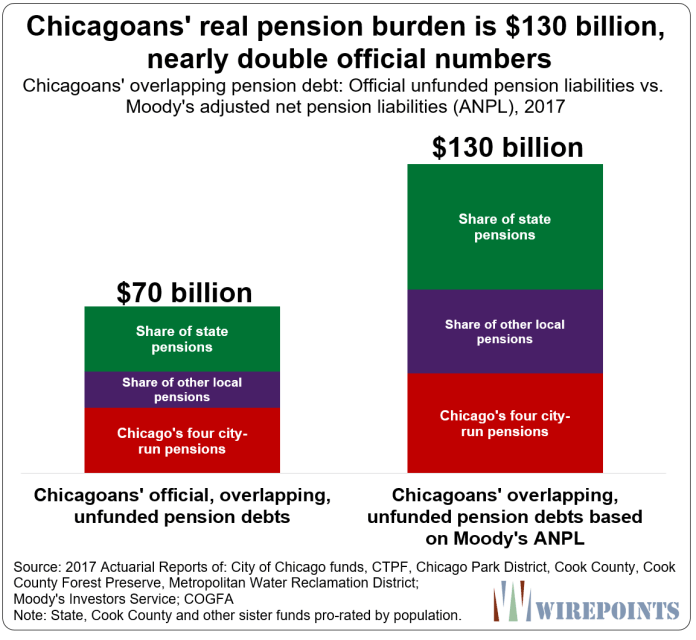 Under Moody’s calculations – what they call the Adjusted Net Pension Liability (ANPL) – Chicagoans’ pension debt burden is far bigger. The unfunded liability of Chicago’s four city-run funds alone under Moody’s calculation swells to $42 billion. Chicago Teachers Pension Fund debt more than doubles to $25 billion. And Chicagoans’ share of the state’s $250 billion ANPL becomes $53 billion. In all, Chicagoans are on the hook for $130 billion in unfunded overlapping Chicago-area and state ANPL, according to Moody’s. That translates to nearly $125,000 in pension debt for every household in Chicago. But with so many Chicagoans in or near poverty (27 percent), that burden won’t be distributed evenly. Expect Chicago’s middle class to be stuck with an even bigger burden that makes up for those that can’t pay. Chicagoans are stuck watching their elected officials do all the wrong things when it comes to pensions. Politicians have passed record property tax hikes. They’ve covered up the city’s financial problems with gimmicks. They’re looking at a $10 billion pension bond to paper over the crisis. And they won’t even tell the truth about the massive amount of unfunded liabilities residents are facing. Fixing the pension crises in Illinois starts with telling the truth. Because acknowledging the real numbers shows just how important real reform is.